In a striking shift in charitable donations methods, Americans under age 40 are now just as likely to give donations to disaster relief through digital means as they are through traditional means. In the immediate aftermath of the Japan earthquake, tsunami, and nuclear plant crisis, some 12% of Americans between ages 18 and 39 say they donated money to relief via the internet or their cell phone. Another 12% in that age group say they gave through traditional means such as over the phone, in person, or by postal mail. That is a notable jump in the proportion of under-40 Americans who gave digitally in the aftermath of the Indian Ocean tsunami. At that time, 5% of Americans ages 18-39 donated to relief efforts and 20% donated via traditional means. Older Americans are also more likely than in the past to give to disaster relief efforts via electronic means, but they still prefer traditional methods of giving. In the first days after the Japanese disaster, 21% of Americans say they have made a donation to help those affected by the earthquake and tsunami. Another 24% say they plan to make a donation. More than a third of those who have already donated (36%) say they made their contribution digitally – online, through text messages or e-mail. Among those younger than 40, about as many have donated digitally as through more traditional methods. Less than a week after the January 2010 earthquake in Haiti, 48% said they either had (18%) or planned (30%) to make a donation to relief efforts there. But the number who actually donated rose quickly in the weeks following the quake. By early February, more than half (52%) said they had made a donation and another 12% said they planned to do so. 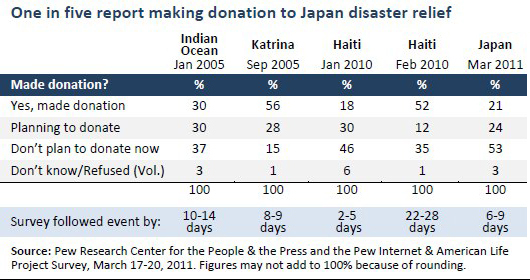 Among those who gave, donations made through traditional methods – in person, over the telephone or by mail – are still more popular than donating digitally: 11% of the public (55% of those who have made a donation) have given to the Japan relief effort through traditional means, compared with 8% (36% of those who have made a donation) who have done so digitally (on the internet, by text message or via email). The balance between donations made traditionally and digitally was similar in the immediate aftermath of the Haiti earthquake. Still, digital donations have grown in popularity in recent years. Six years ago, just after the deadly Indian Ocean tsunami, the balance tilted much more heavily toward traditional giving: 25% of the public said they had given by tradition means, while 4% said they had given digitally. The change is most striking among younger people. 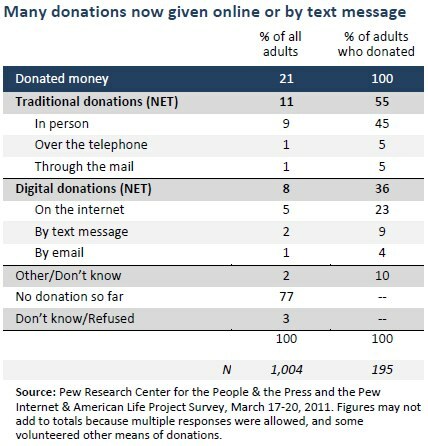 Currently, those under 40 are just as likely to say they donated through traditional or digital means (12% each). Following the Indian Ocean tsunami, 20% said they had donated traditionally, while 5% said they had donated digitally. Digital giving is also becoming more popular among college graduates. Following the Indian Ocean tsunami, 33% of college graduates said they had donated traditionally, while 10% said they had donated digitally. 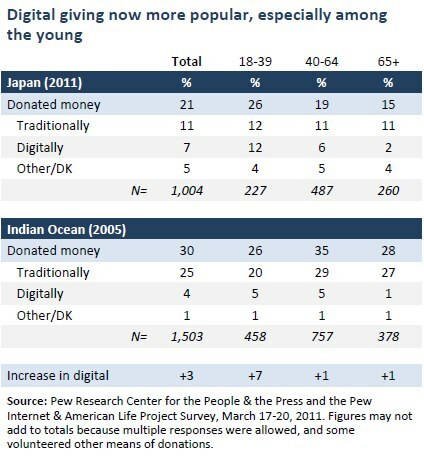 Currently, giving to Japan among college graduates is evenly split between digital donations (12%) and traditional donations (14%).